Apple isn’t usually the kind of manufacturer that sees its latest and greatest wares receive discounts at retail, with even the smallest of price drop rarely associated with something branded with an Apple logo. When Best Buy reduced both the iPad Air 2 and iPad mini 3 as part of its recent Black Friday sale, it was already going against the tide and, we suspect, Apple’s wishes. So the latest news regarding Apple’s two newest tablets is very interesting indeed and it once again includes the big box retailer Best Buy. Starting today, Apple’s iPad Air 2 will receive a $50 discount and the iPad mini 3 will receive between a $50 and $100 discount depending on which model you happen to choose. 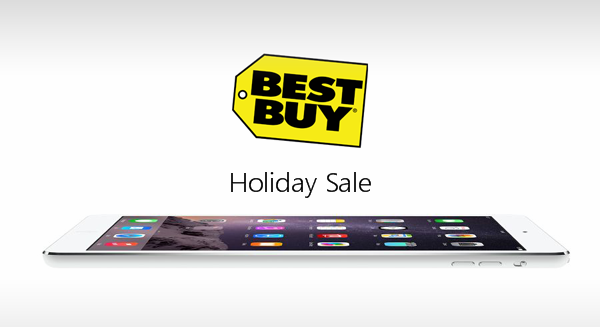 The high-end 128GB WiFi and cellular iPad mini 3 now costs just $629 in a Best Buy store – a saving of over $99. What’s worth noting here is that the discounts are of the instant variety too, so no messing around having to remember to mail any rebates in which, let us be totally honest, most of us forget to do anyway. You can check out all of these deals at the official Best Buy website. If you’ve been toying with the idea of picking up one of Apple’s flashiest tablets of late then now is the time to take the plunge. After all, who doesn’t like saving a bit of money? Even better, you could choose a more capable model and pay the same price instead. Go on, it’s Christmas. You’re worth it!